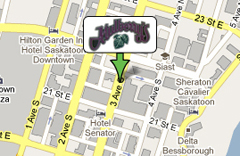 Welcome to Mulberry's located in the heart of downtown on the corner of 3rd avenue and 23rd street in Saskatoon. We have something for everyone whether it is early morning breakfast, fresh baked bread, late night parties, fundraisers or catering. Mulberry's is sure to have something for you. You can have Mulberrys delicious food come to you! Here is our Catering Menu to help you plan your next gathering. We also have two large dining areas to host your Special Occasion. For more information on our Steak Nights click here.